Apple has started to roll out the first updates to its Maps application, starting with the restoration of some major New York City landmarks. The missing Statue of Liberty, which presumably was visiting friends and family back in France, is now safely back on American soil according to Apple Maps' updated 3D satellite imagery. Also, the once hopelessly-distorted Brooklyn Bridge now appears in all its majestic glory, in the ongoing, but unannounced updates. 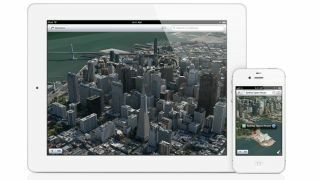 The 3D Flyover feature for Apple Maps was touted as one of the headline features of the new offering but has been subject to ridicule since the app's launch within iOS 6 in mid-September. It is, of course, wise for Apple to tackle the most glaring omissions to the Maps app first as they have been subject to the greatest level of mickey-taking. However, there remains huge amount of work to be done before the product meets the expectations of Apple fans and the company itself. Last week Apple CEO Tim Cook made an unprecedented apology in which he admitted the company "fell short" on its commitment to deliver the best experiences for its users. Now New York is on the way to being fixed, perhaps Apple could work on removing the omnipresent cloud cover, currently enshrouding the whole of England?